Leaving the #TIES18 conference after a 3 day PD high is both exhilarating and exhausting. Your brain is ON and thinking/discussing/reflecting at all times. I had so many ideas, I felt it was time to dust off the blog, and jot a few of them here. This year I have been on a design thinking mission! Any chance I can learn about it, observe others facilitate it, I am in! 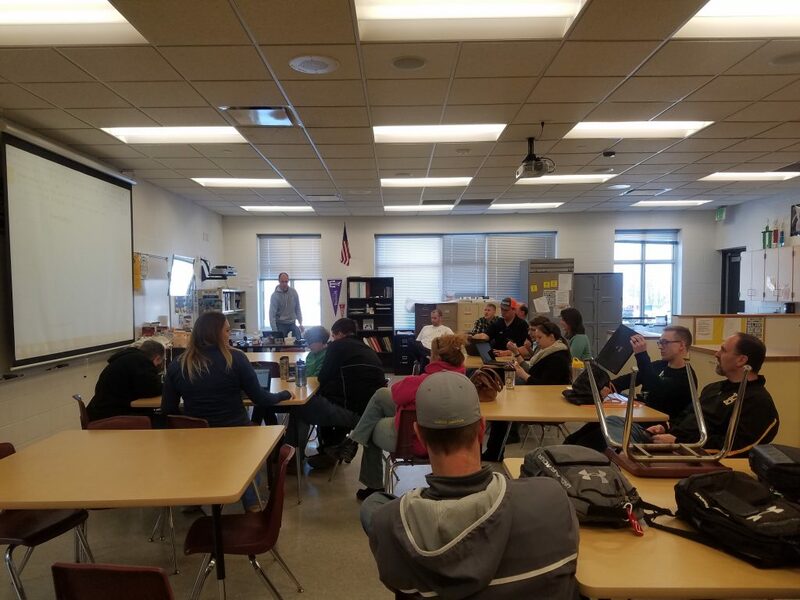 The majority of participants in the room, just happened to be coaches/admin talking about the struggles of trying to get teachers to integrate more technology or maker type spaces. Some shared challenges with their leadership in having the vision to help guide their buildings/schools. Others shared that they had not been recognized for the work they were already doing (not the Rah Rah type recognition, just any feedback from their admin or peers). We talked about influence, and in what ways could a person (no matter where they were in the organization) could help influence others. (whether they be peers or admin). We came up with some fairly cool prototype ideas. One was a website with VR video, student interviews, and artifacts of work for others to see. This is actually a tangible idea…. ACTION: This whole conversation reminded me of my own work/goals this year and I want to get stories out for others to see. Can I get a story out by the time we go to break? I am going to try! Also, use some of the DT thinking strategies with our Byron Innovation Team!!! Did not attend a session…side convo! – I was perusing the #ties18 hashtag when I came across a tweet by @charlieborak with a picture of a butterfly and a tweet about some sort of grid method. Well, of course, I was curious and started asking questions! Charlie lead me to https://teachbetter.com and their team @TechieTeachOtt @RaeHughart @chadostrowski. I decided to check their website out. Little did I know, with a simple login, I would gain access to some free intro materials to their method. When I see personalized learning, I often hear of “playlists”. 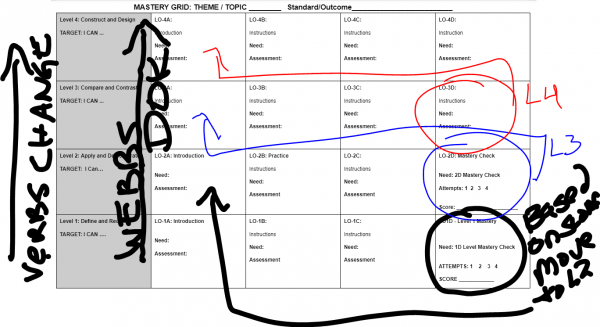 The grid takes it up a notch by scaffolding different layers of WEBBs DOK with learning targets. It provides a personalized pace and students are allowed to move along the continuum as they need. Students that struggle, can receive more time with the teacher on basic concepts to assist them in their education. It is chock-full of assessment and feedback opportunities with the teacher. (or peer assessment too) Students must achieve a certain “score/percentage” on the final “mastery check” before moving to the next level of learning. I am wondering – what would happen if you mixed this up further with some student choice as well? I think you could also design this as a hyperdoc too! The irony of this learning (starting with Charlie’s tweet) was that I happened to be in the same class with him (and his team) the next day. I picked their brains! They emailed me a few more resources and it was awesome! Mind you, I have never met Charlie until TIES. 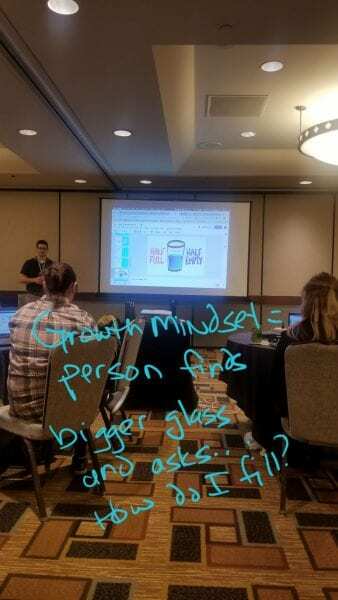 I would not have known this new strategy if it wasn’t for the tweet of his session experience – nor would it sparked the convo of this amazing idea. The power of melding the F2F convos with the online convo is incredible! Action: Share with CIA team, our Blended Learning Cohort, and a few others that might be interested in seeing! Maybe even try to design my own PD type activity using the grid? What a fantastic session this was. I did a ton of reflecting of our current district-wide PD (with our own form of personalization) with the ideas presented at the session. We had a number of discussions about mindset and that mindset and belief systems need to be addressed before foregoing any big change. 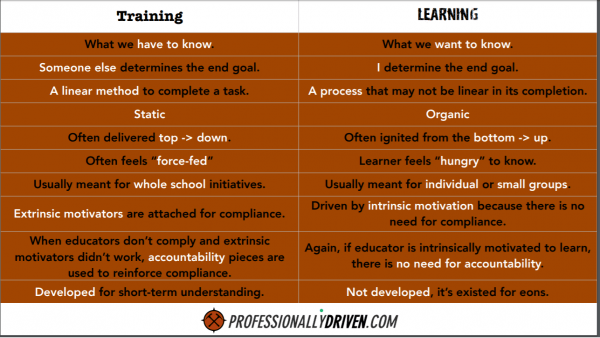 Big takeaways – If we focus on extrinsic motivators- our PD system most likely will not be sustainable. Find ways to connect intrinsics into your PD. Strengths and Weakness Chart – work on moving 1 weakness over to the left. What is PD like? Training vs. Learning. 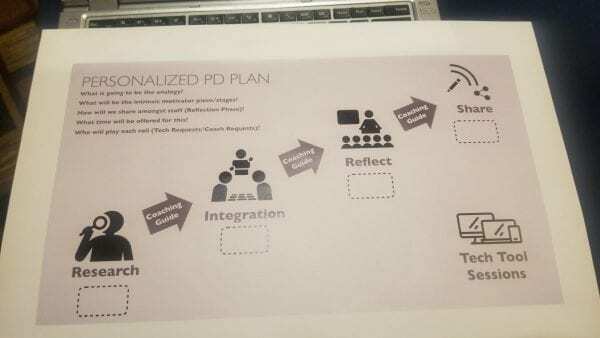 PD Plan. I feel our PD we did the past 2 years incorporated some of this. His recommendation monthly. Action: Share with the leadership team the posters I got from this presentation. Share with CIA team at our next coaching meeting! I met Jennifer several years ago virtually in a Voxer Book study around George Couros’s book – The innovator’s Mindset. Ever since then, I have admired her from afar! She is doing so many great things – when I seen she had a 3 hours session on Sunday… I knew I had to sign up! When we think about digital leadership, we usually think about adults. 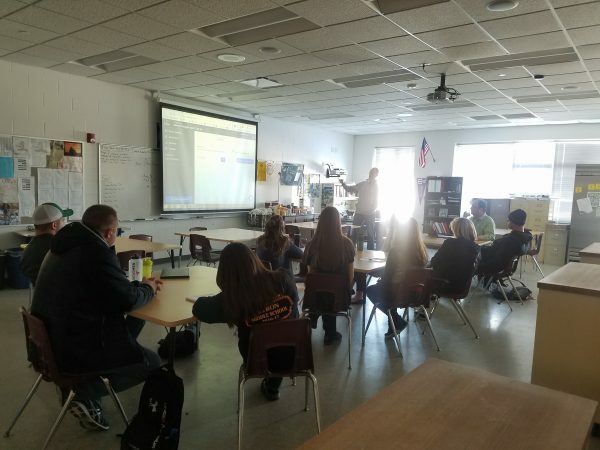 However, this session was about the digital leadership of our students and ways we can empower them to develop their own positive digital footprint! She did not disappoint! I loved how she gave us a slideshow with edit access so we could add our own experiences, ideas, findings! She talked a little bit, gave us a quick overview of a few slides, and then let us have time to explore. We would reflect and repeat. This woman has a WEALTH of awesome ideas, resources and amazing things she has seen and done. I need to do a deep dive into her slideshow as there are things I can CERTAINLY share with others….especially in our Real World Learning design cohort! One of the resources that I specifically appreciated with a digital citizenship planning guide GEM created by Alec Couros (yes, George’s brother). The rubrics in it are fantastic and this is perfect timing as we are developing our 3-year tech plan and citizenship is one of the things that is at the top of my list! 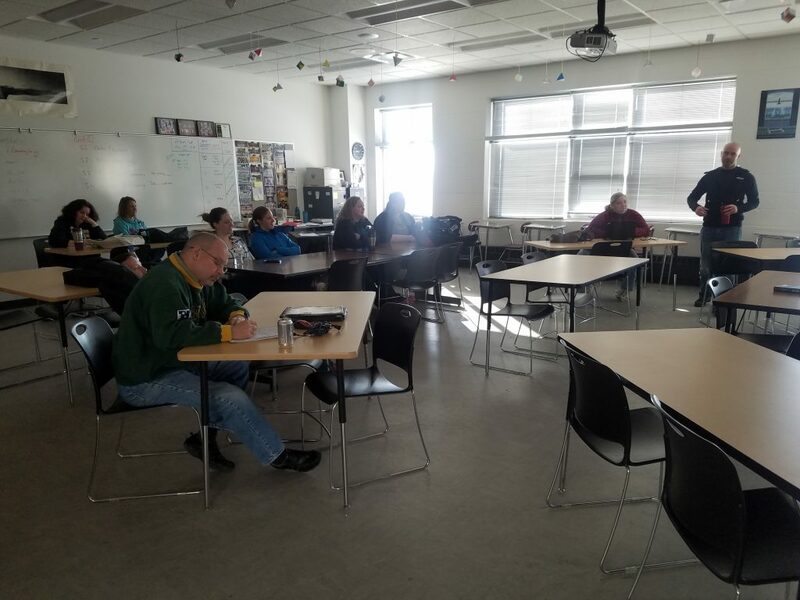 Action: Share the planning guide with the district tech team, 8th grade ELA teachers. Continue to design and try to integrate a Student Communications Intern (11-12 student) in Byron. I would like to figure out how I can get this to go 2nd semester! Stay tuned! @JCasap provided us with a fantastic keynote! He has had an amazing career! Helped launch Google Apps for Education and Chromebooks for Education. WOW! Everything he shared with us reaffirmed our Profile of a Graduate Work. Below are a couple of my Tweets that struck a chord and I want to refer back to! My tweet below is staggering. I will definitely be continuing to advocate for computer science in our schools! Action: Refer back to this as we move further in the development of our POG graduation requirement. Share with the appropriate leaders. 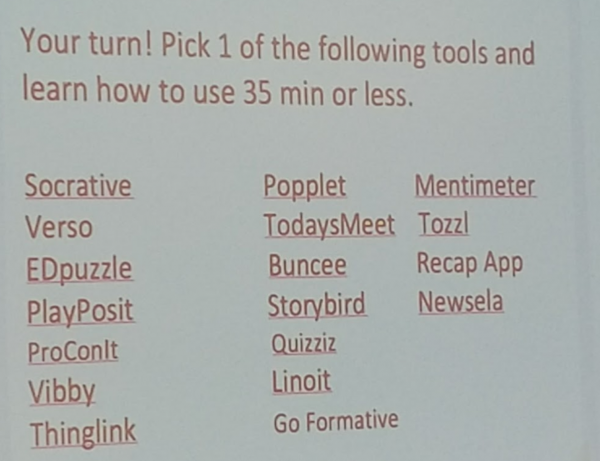 Even though I didn’t get to see his session – Sean Beaverson shared an AWESOME resource of his Favorite Google things. Action: I need to review this for my own self PD! Possibly share a few things with our Google Educator Cohort! Some of my MN PLN friends (@irvspanish @RPiersonEdu @MissField5 @mrskalthoff @jbormann3 @sschwister – and yours truly- were interviewed over the weekend. The video was featured before Monday’s keynote. Even though I was way out of my comfort zone…Had to share it to my blog! Just because it’s transformative… doesn’t mean its deep! 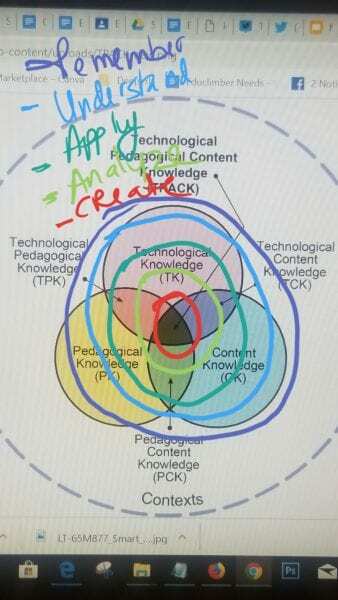 I happened to participate in an online conversation today about SAMR in which members of that group were collaborating and submitting artifacts based on the SAMR model of technology integration. I think this is important. As schools are investing in technology, we want to make sure our teachers and students understand how to use tech and the new opportunities that can “transform” learning. As a tech director and a self-proclaimed innovator, technology and the potential for transformation excite me. Technology can alter the way we do things and create new efficiencies and opportunities. Technology can also be engaging! For many – tinkering with new gadgets and ideas and trying to figure them out is fun. VIP to Remember. When designing/observing rich learning experiences using technology, we need to keep a keen eye on what the student actually knows and understands. Sometimes technology integration that could be considered “transformative” can also have student learning (thinking!) at the low end of cognitive levels. For example, let’s say you have a small group of students collaborating on Google Slides and then recording a video presentation(on any given topic) and “sharing with the world”. Transformative right? But, if all they are doing is Googling, copy/pasting, adding a few Google images and reading slides (or notes from their iPads/Chromebooks/devices) – I wonder how much they actually know/understand of the original learning objective? Collaborative Yes. Creative. Maybe. Deep Learning? Not so sure. If the task goes beyond low level of copy/paste research and actually requires higher order thinking (like Level 3 and 4 of Webbs Depth of Knowledge) AND uses upper levels of SAMR… now we are talking about exciting transformation! So let’s go back to that simple research project example and ask some What If questions to see if we can improve the original project and move learning up the cognitive domains. It basically boils down to this… If we are going to take the time to “redefine” our learning tasks through the innovative use of technology – let’s make sure we are also deepening the understanding of our learning objective(s). We will certainly get more “learning bang” for our “technology buck”! I sent this out in an email to our teachers tonight. Thought I would share it with you too! Maybe you can consider doing the same with your educators! 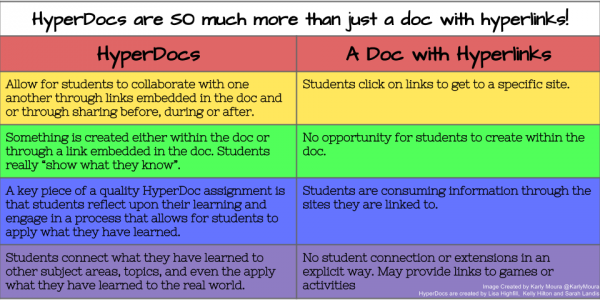 I wanted to share a few resources around Hyperdocs. What is a #hyperdoc? = It essentially is a digital interactive lesson/activity designed using Google Docs, Slides, or Maps. These docs are then shared with students using tools like QR codes, Google Classroom, email, Moodle, Website, Ect. Here is an example of a typical template that you can easily make a copy of and begin editing with your own resources. Here is a Google Drive folder FULL of #hypedoc activities/lessons ready for the taking and ready for your own edits…organized by subject. Use them as whole class activities. Use them to differentiate learning via abilities/interests, or use them as one of your stations! Remember to add the folder to your drive, you will also receive updates as new #hyperdocs are added. If you have any other questions – please let me know! PS – IDEA – One possible extension or lesson activity is to have students create their own hyperdocs as evidence of learning. 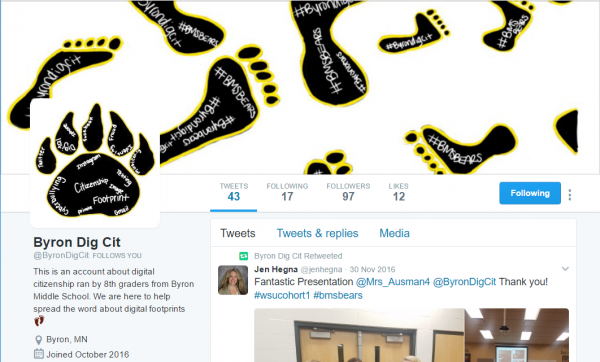 P.S.S – Follow Teachers Give Teachers and/or watch the #hyperdoc hashtag on twitter for other educators who are donating their lessons for free! We are continuing our journey to learn, work, and apply deeper learning as a district. 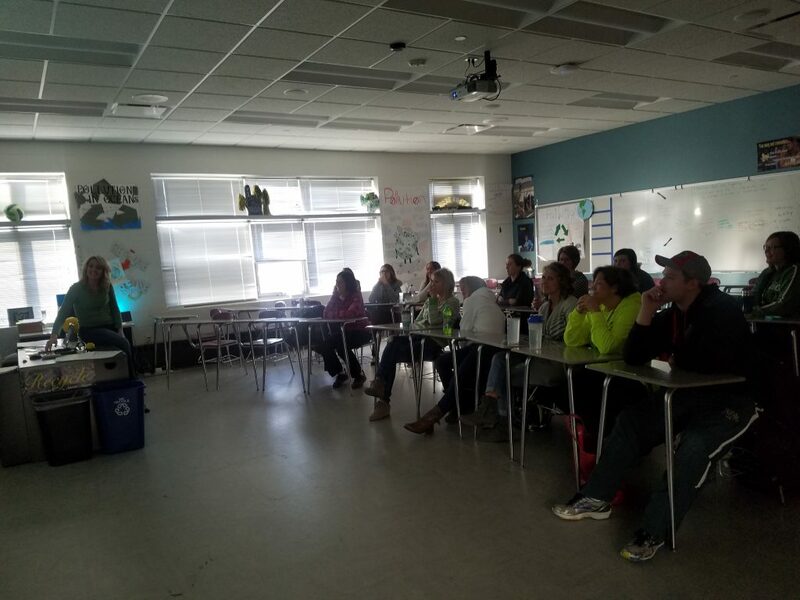 (Year 2) This past Monday, during our PD day, we stayed the course and teachers brought deeper learning artifacts to share/discuss/reflect on. We also introduced metacognition/reflection strategies to use with students. Our equity coach, Andrea Laning, provided equity training for our staff. 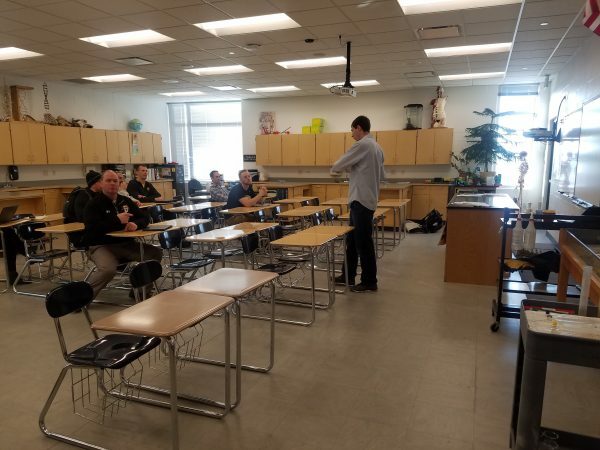 While I am only reflecting on the deeper learning portion of the day, I do see the the connections of equity and deeper learning – especially when you think about personalized learning. But that will be a future post! Demonstrate deeper learning and the skills, knowledge, and experiences acquired by that learning – maybe even dispositions? We kicked off the day with several educators (from each of our buildings) to showcase student learning artifacts! We then had some time to discuss/reflect on what we saw and heard from those short presentations as well as our own deep learning digital artifacts. Our educators submitted their artifacts (via Google Forms) and reflected on them based on the questions above. OH MY. It is this that gets me really excited because, at a district level, we can see all of the great things our teachers are doing as well as the great things our students are learning! Are we there yet? No. However, I now have a measure. 56.6 % of our teachers feel their artifacts either meets or exceeds deeper learning. The written reflections about the experience were incredible. They included thinking about “all” students achieving at high levels, as well as thinking about the engagement of all students. The majority of educators also had great insights on how they could improve the experience the next time. Right now, this information is only available to our admin and coaches. I honestly think it would be valuable for all educators to see this and the learning potential could be HUGE! 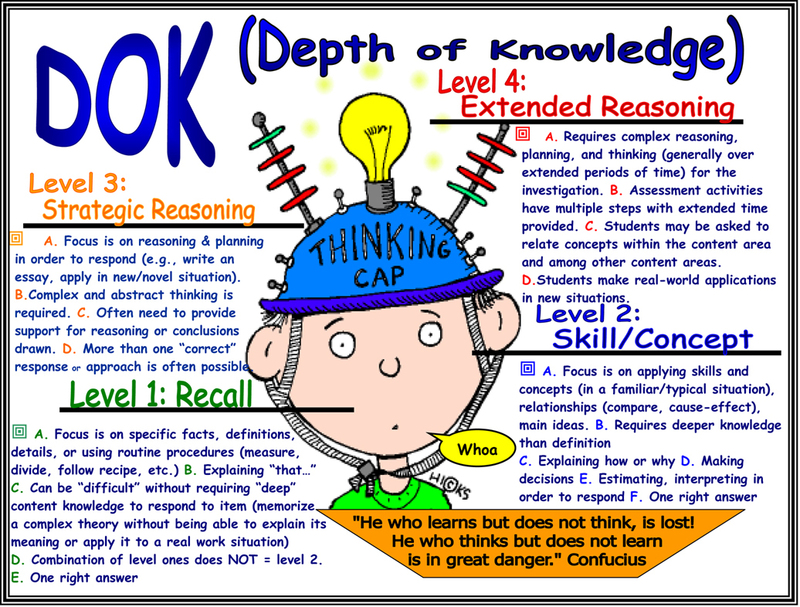 I designed a thinking map (using Googlel Draw) for this activity so that our educators to somewhat document their understanding of the topic that included some thinking prompts. that one could either draw or submit via Google Drive. Some of them even tweeted it out! We collected thinking maps from all of our staff. Our intent, as with any formative assessment, is to follow up and provide feedback to our teachers. We also will use the information we have collected, to better differentiate the next PD day in January. Deliverables – Teachers are to bring a deeper learning student artifact that also has a quality student reflection. Timing and activities. Some of the activities might have seemed rushed. But, I am happy to have modeled metacognition/reflection (thinking map, survey) through this experience! 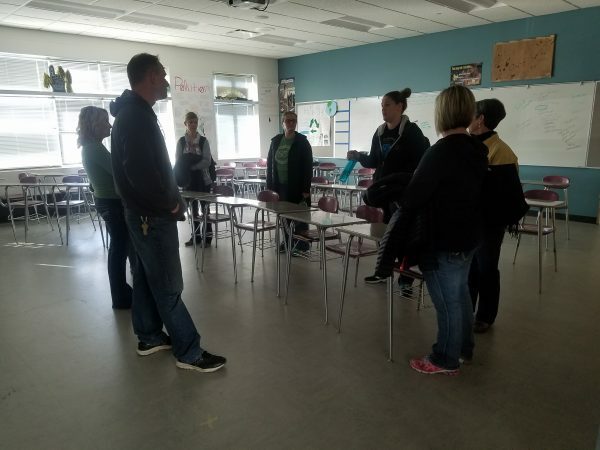 More collaborative activities – including collaboration outside of team/plcs – cross building! Have a high energy starter. Google doc artifacts that were shared – needed “everyone with the link can view”. Can we flip some content? Differentiate! Now that we have collected some formative assessments, I believe we will be able to do that better. 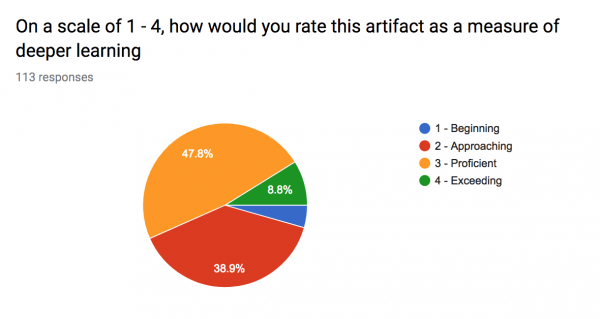 Share artifact submissions/ reflection across the district with teachers. After sifting through my goals and evidence (below) I have decided to stick with these goals for another year. I am not sure I will ever fully “arrive” with this goal but I know I can always continue to improve. As I reflect back on what I did to learn/sharpen my skills I certainly feel I had a successful attempt last year! Meet and connect with peers and colleagues. I will be honest, I am needing connection and networking right now… I actually am craving it. Last year, I felt hyperconnected both f2f and online. This year is different for me. The startup of the school year does not lend itself to allow for networking. My personal life was certainly more chaotic than normal. I miss #wsucohort1 and the regular conversations, debates, ideas, and action that came from that group. 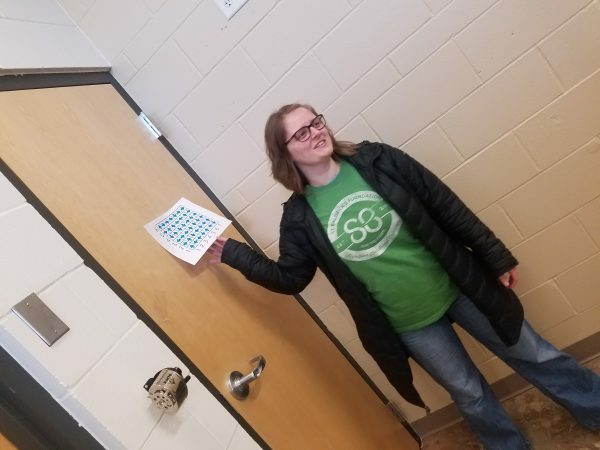 I recognized missing connections this month when I was chatting about personalized learning with @travislape or visiting @katiemorlock and talking about student agency. Or chatting with a steering team at WSU about the future of the ed leadership program and numerous convos with teachers and coaches in my district. Shadow 3 leaders in their field. I would also like to shadow a leader outside of education. Maybe an entrepreneur? Continue to build PLN. Seek out and be active in a few more twitter chats! Both formal and informal! 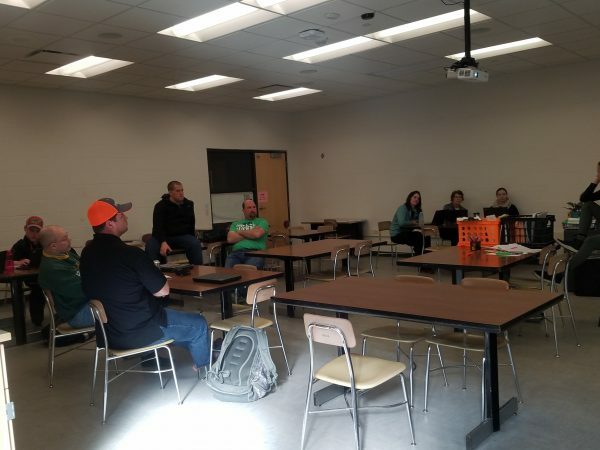 Connect 1:1 on a regular basis with a team of educators. I have a desire to connect with educators to first and foremost learn and grow. 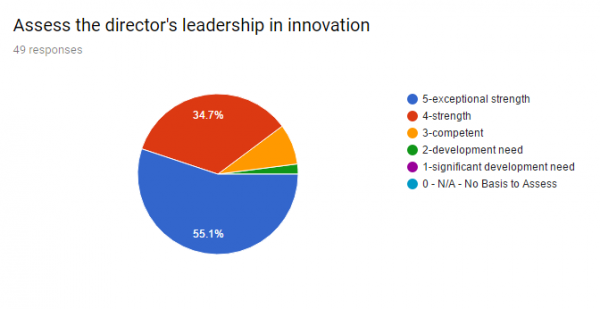 From my 360, as well as my own self-analysis, I need to learn what best practices and innovation (with or without tech) looks like in our schools and especially our lower grades. However, my dream would be to have a couple of go to people in each building. Interested? Share strategies and success stories. This year, 3 -5 grade has been added to our 1:1 program. We have migrated to Chromebooks in our HS. We are on year 2 of our ePortfolio adoption. As we continue down the road of deeper learning and innovation, I would like to figure out a way to regular communicate strategies and success effectively. I feel I do a fairly good job with Twitter – but I am missing quite a few educators if that is my main method. I am actually curious about using a blog/vlog similar what @AndyLeiser used. (USing SeeSaw Blogs) https://blog.seesaw.me/200tips/#!/ Stay tuned! Continue to design and develop PD. I hate Sit and Get. Looking for innovative models I can use with both large groups 120+, medium groups 30+, and small groups 5-10. Model. Model. Model. Continue to build and practice coaching skills. Model. Model. Model. Continue to blog. Minimum monthly. Don’t always try and write a book! Define and communicate my city on the hill. One of my favorite quotes my 360 was “Make sure to clearly define your “city on a hill” that you are trying to get to. Develop a path to get there and help people see how they can get on the path and move the same direction. Also, make sure that you are not overextending yourself in so many different areas. 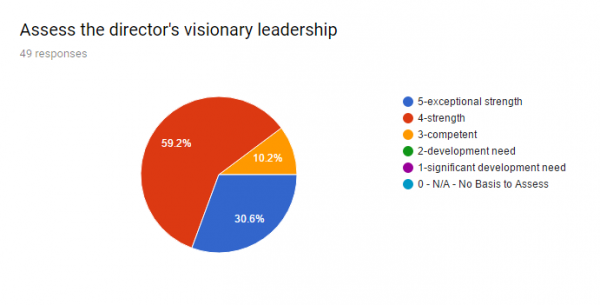 Make sure that the teams you are on feel supported by you since you are the one with many of the solutions they need.” I have since created a scale that helps define a vision for technology. I believe with the connections and learning (above) it will help me to understand if this vision is actually applicable in all grade levels. We have included it in our walkthru observation tool as well. This at least will provide a measure of where we are as a district. And more importantly, is our PD efforts making a difference? Transformative Learning – Students create complex artifacts, of their own design, from real-world problems, to raise awareness, publish works, advocate for an issue, or take action on real-world problems for audiences outside of the classroom. 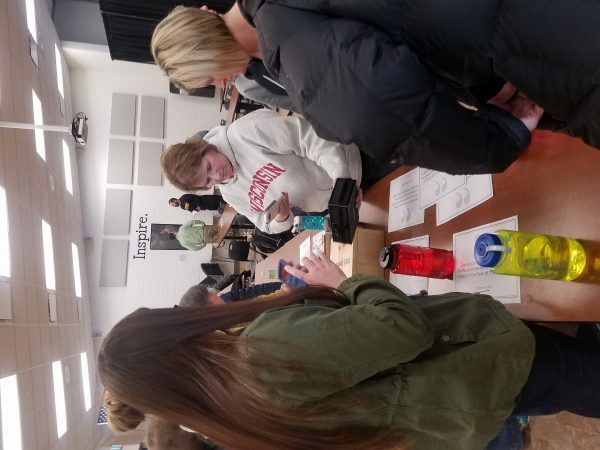 Student use of technology – Transformative – Students create complex digital artifacts, of their own design, from real-world problems and use technology to raise awareness, publish works, advocate for an issue, or take action on problems for audiences outside of the classroom. Teachers in our 1:1 classrooms providing more authentic learning experiences – From 48% of classrooms to 58% of classrooms. Increase the number of people who consider my communication skills and stakeholder centered leadership as strengths or exceptional strengths by 5 %. I will follow up with another post at a later date about the following goals. Stay tuned! It was important to select key stakeholders as I needed a wide group of people to get the best feedback. I wanted evaluators with varying degree of technology experience. 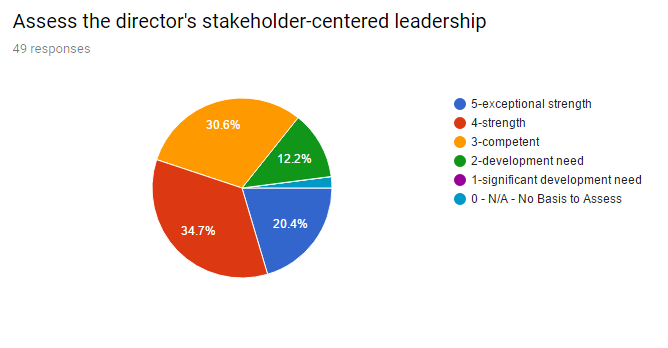 I also wanted to make sure opinion leaders from each stakeholder group was selected. Some I work with directly on a regular basis, others I work more indirectly. 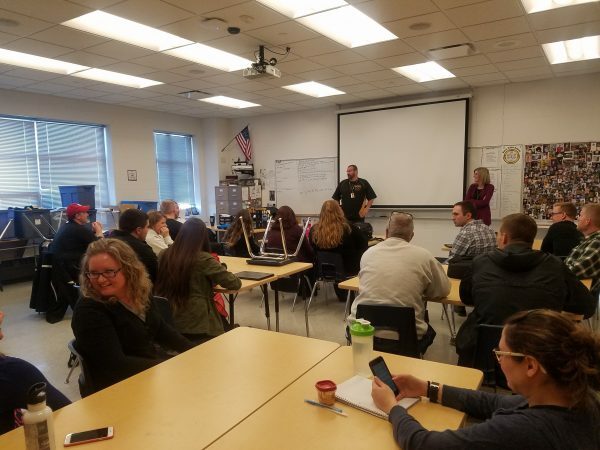 50 people were selected from the educators, administrators, and support staff groups. I had 49 provide feedback. 32 Teachers, 8 administrators, and 9 support staff from across buildings, grade levels, and disciplines. To put this in perspective…it’s approximately 25% of our staff at Byron Public Schools. 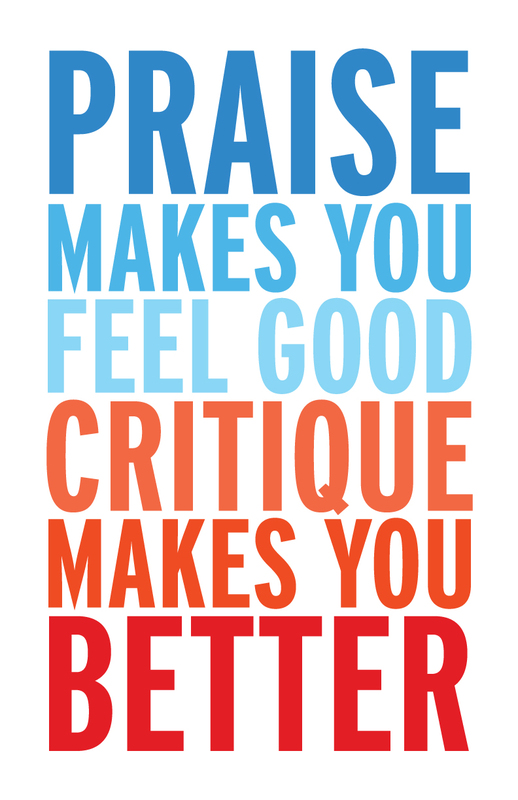 First and foremost, I have to say this can be a little scary…to have multiple people evaluate you and your work. (vs a single supervisor/superintendent) But, this evaluation was for me and I had to have the right mindset to accept feedback (both positive and critical) in order to grow professionally. I also knew that I was going to be completely transparent in this process and that included posting the results here, on my blog. I was extremely humbled by the positive comments I received from all employee groups. I truly feel valued by the district. I also appreciate the concrete ideas I received to become a better leader. I never once felt blindsided by remarks and I want to personally thank all who provided feedback. I feel good about these results and the direction I need to go. While vision and innovation are my strengths, I have some work to do in stakeholder focus/communication. 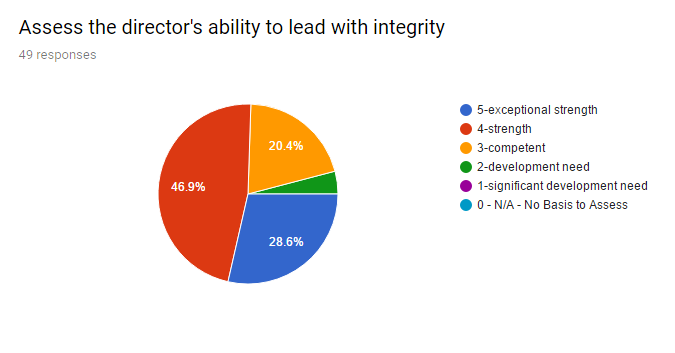 Below are the results from the survey with key remarks for improvement by each employee group. If you are reading this post and have some strategies of how you would proceed – feel free to reply to this post, tweet, email, ect! My plans are to continue to reflect on this and create a personal action plan over the summer. This past week, I was fortunate to spend an entire day with Eric Sheninger at a workshop session called Digital Leadership. I have been a follower of Eric’s for some time, watched his Ted Talk and read his Digital Leadership: Changing Paradigms for Changing Times book. (which is now signed!) But, I have never had the opportunity to hear him speak. SO, when I found out he was coming to Rochester, MN and would have a whole day session – I was in! He provided incredible insights on how he was able to lead his school, New Milford High School a small high school with 600+ kids in New Jersey, with high diversity, little or no technology to become a nationally recognized school and greatly improving test scores and graduation rates. Below are my key takeaways! If he did not observe something in action, he would email his teachers and they would have so much time to provide the information. This would include learner artifacts and the standards they were aligned to. One of my favorite quotes from his session – “I collect assessments, not lesson plans”. I would have to guess the conversations around learning would be incredibly powerful with the data/evidence! The collection of digital artifacts were beneficial for his educators too, as all educators have e-portfolios and are provided time (on the job) to work on their ePortfolios. To do this, Sheninger eliminated non-instructional “duty-time”. “We do not need $45/hr cafeteria monitors”. 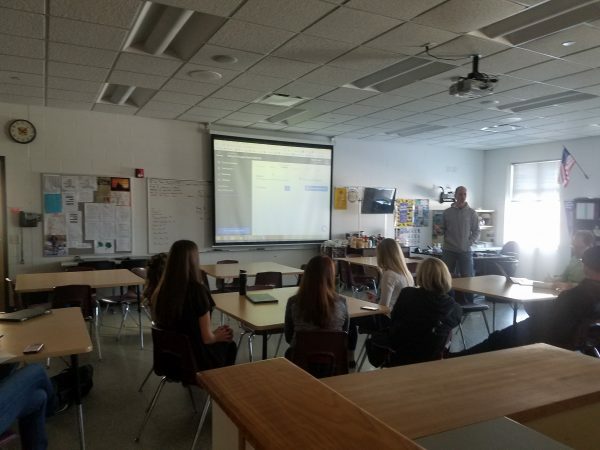 Instead, he opted to provide team time and time for educators to reflect on their practice. 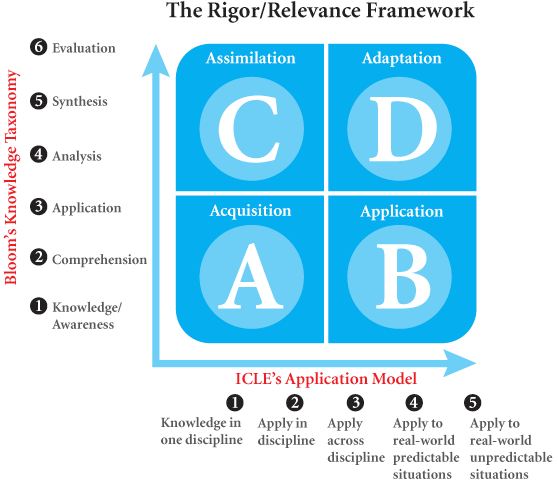 Sheninger also shared the Relevance Instructional Design Framework developed by the International Center for Leadership in Education. (Sheninger now works for them). While we have been focusing on deeper learning this year, what I like about this framework is it provides a scaffold of these types of learning environments. 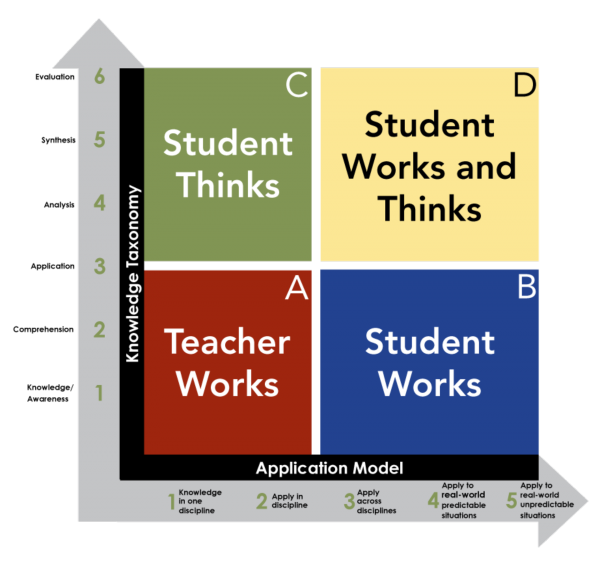 Sheninger said while our goal should be to get our students to quadrant D, it is impossible to reside there at all times. In my opinion, It is also not fair to kids to provide them with an education that never allows them to move out of Quadrant A. 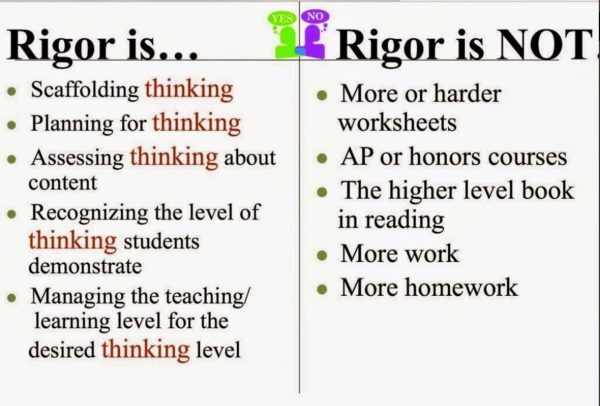 As I was perusing the leadered website, I did stumble on the rubric that aligns with the framework. Question to self – Could this align to our scale work? Should this framework be used in my Real World Learning design course? 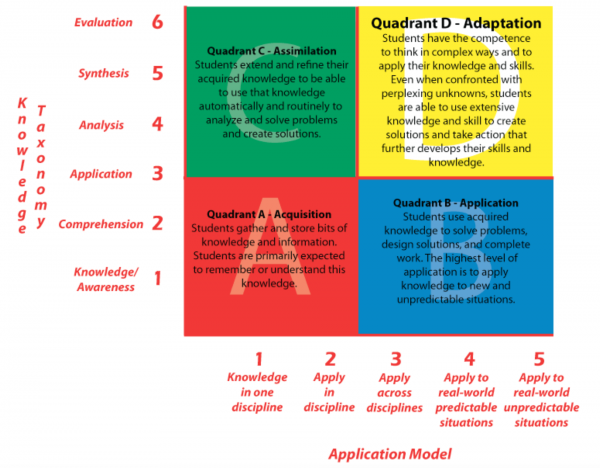 Questions to reflect on… what do assessments look like in each quadrant? My guess, as you move from quadrant to quadrant, the assessments move from knowledge-based assessments (quizzes/tests) to performance-based assessments. Eric did share one such project from his school and the rubric to match! I believe all students in his HS had ePortfolios. We should not only use student ePortfolios to show what they know… but show what they understand. Evidence and reflection will be key. We need to “marry innovation with achievement when we look at instructional design”. While we are always seeking to engage our students, engagement does not automatically equate to learning. I have been guilty of this numerous times. I get excited by shiny things but at the end of the day, if our students are not learning our objectives, we are wasting valuable instructional time. It’s important to continually assess their understanding. Can learning be fun? Absolutely! But we need to keep the lessons/activities learner and learning focused! As for technology, there is no doubt it can amplify and accelerate learning vs. “water it down”. Instead, we should ask ourselves how can technology be used to support sound student-centered pedagogy? If leadership doesn’t get it – it’s not going to happen. This includes leaders in classrooms, schools, districts! Eric did a very good job modeling tools and effective practices during this session. When I think of PD, this is the biggest improvement needed in our schools. 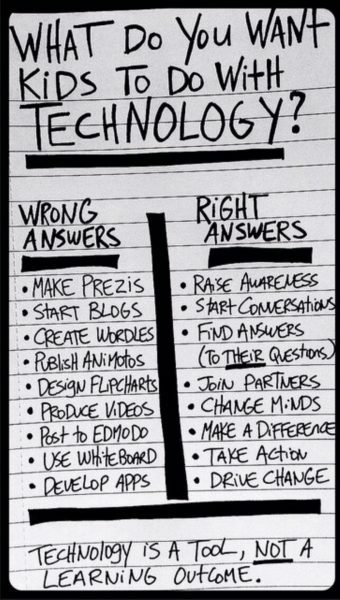 I rarely see people MODEL effective technology with effective PD design. RARELY. 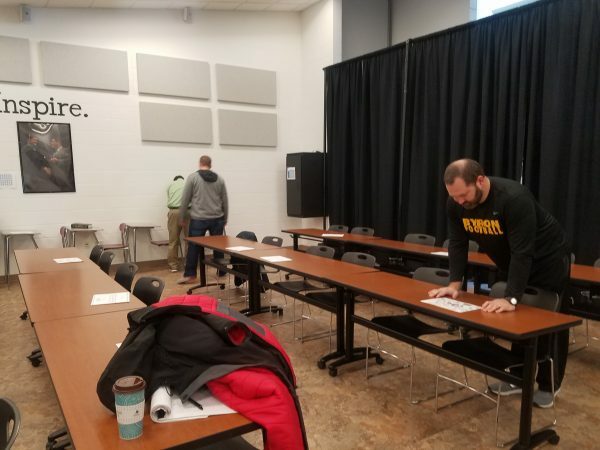 While I feel good about the district side PD we tried this year, (post) we need to challenge ourselves improve PD in our districts – modeling is key! All in all it was a fantastic day of learning, conversations, and reflection! Below is the storified tweets from this session. How will this newly aquired information be applied, assimilated, or adapted???? Well…that is to be continued! This reflection will serve as an artifact to meet my goals this year to improve my leadership presence and deepen my understanding of today’s educational environment. 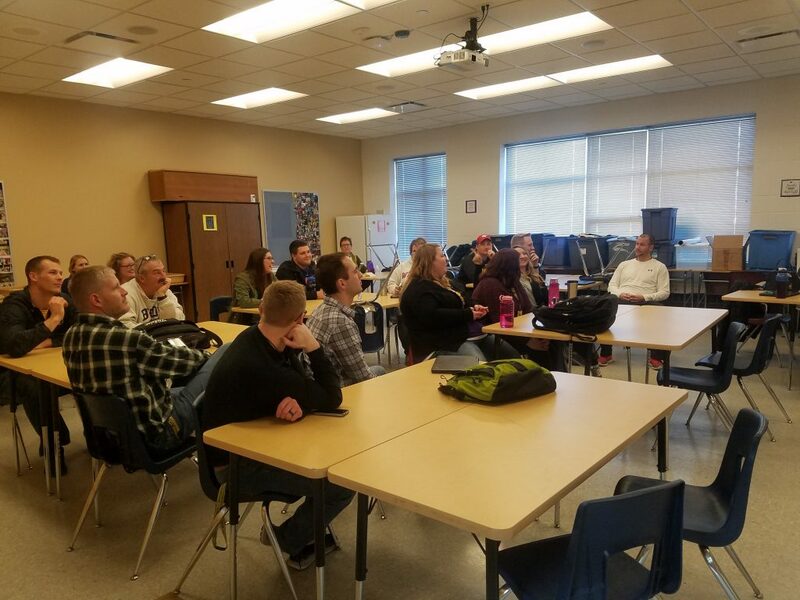 As shared in an earlier post, our district-wide PD efforts this year have been focused on deeper learning. Deeper learning first and foremost aligns to priorities 1 -4 of our district’s strategic plan. It also aligns to the Marzano Framework and PLC work educators have focused on in the past 3 years. (determining critical ELOs, creating common assessment, and scale work). 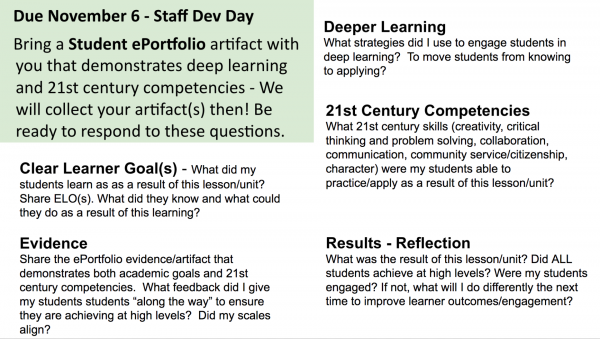 Our district goal was to implement a K-12 ePortfolio system that captures deeper learning. (Official goal – 100% of all teachers will CREATE or REDESIGN and IMPLEMENT at least 3 lesson plans per year that inspire learners to achieve at high levels as measured by student ePortfolio artifacts.) This work also aligns with Marzano Framework Domain 1 Element 12 and 22. We began our process in August (Day 1) introducing the district deeper learning protocol (DLP), that was inspired the Trudacot work of Scott Mcleod and Julie Graber. Staff were provided time to design or re-design lessons that met at least 1 of the facets of the DLP. As a district, we collected their personal action plans and would meet again in October. Staff were to collect student artifacts and share their work with others. Here is a snapshot example of our October day. 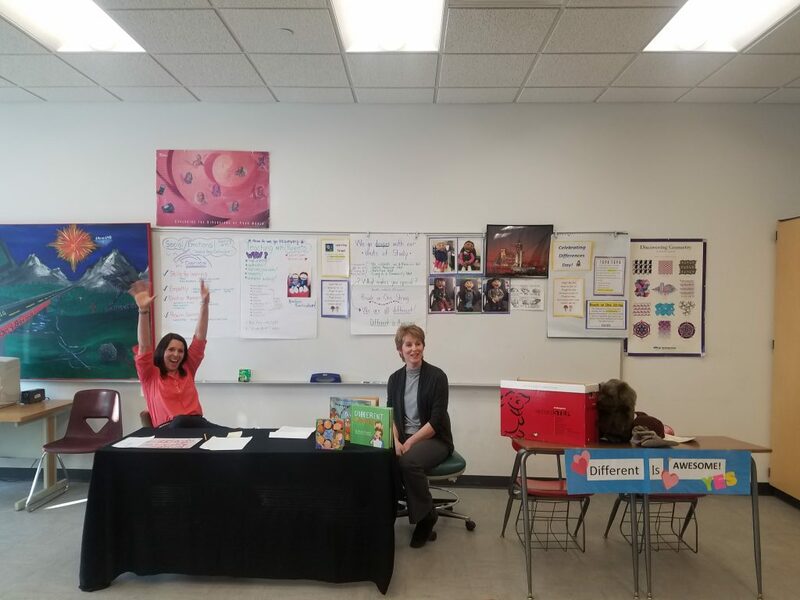 On March 17 we had our last PD day. It comprised of a celebration of sharing of their last redesign lesson, ePortfolio Artifacts, a Teachmeet session led by Byron Educators, and finally a crowdsourced slideshow of our staff’s next Big Ideas! This is a great document to showcase what our staff learned and how they would apply their learning in future lessons! Overall. It was a great morning. Celebrating our educators’ work by focusing on student artifacts was very powerful. 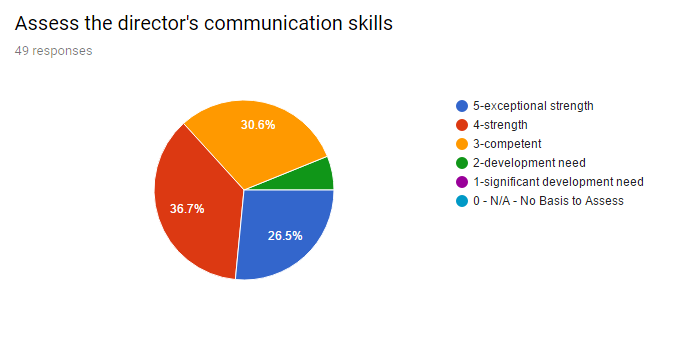 Many educators shared (in our feedback survey) how impressed they were with what other teachers were doing. Then to move to the Teachmeet also proved to be beneficial. We need more opportunities for our educators to learn from one another. Making the invisible – visible (student artifacts, teachers sharing) is proving to have an influence on our educators – especially when you review the IDEAs that were generated after the sessions. PD Design. If we believe deeper learning can benefit students – we should model deeper learning strategies in PD. 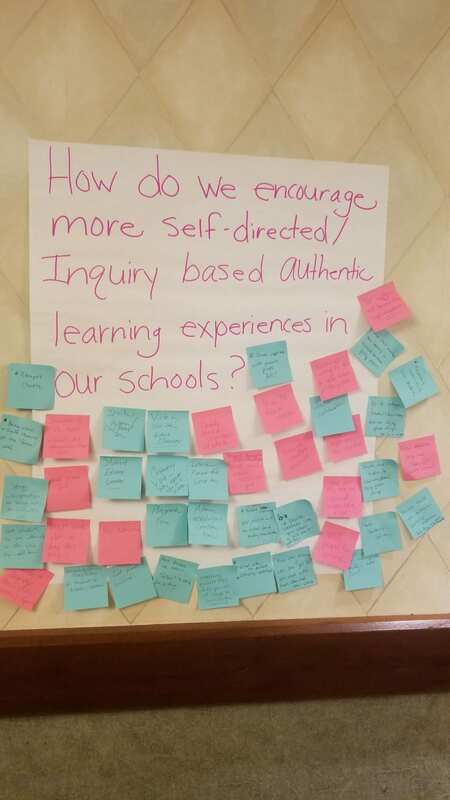 From the Deeper Learning protocol, I believe we modeled learner agency, embedded opportunities for collaboration, creativity, and critical thinking (in the form of reflection) and relevance both in the topic and audience. The role of ePortfolios. Since our move to a k-12 ePortfolio system (SeeSaw for grades K-5 and Google Sites for 6-12) the making of teaching and learning visible is very powerful. Rolling out the ePortoflios has not been perfect. While we have had a few hiccups (will explain in future post), I feel it has been successful – especially for year 1. We certainly have work to do to improve implementation (as results from our survey) BUT I do believe that it is tools like ePortfolios that will help us capture the power of the deeper learning, student growth, and being college – career – life ready. Modeling Failure. I had plenty opportunities to model failure that day. When I arrived at 6:45am , I was welcomed with a “The Wifi is down”. Ugh. Having a pd day (dependent on technology) and the district wifi is down is never a good sign. But the show must go on! I turned on my mobile hotspot, and turned the keys over to the techs (to work with the engineer to solve the problem). During the presentation, I was interrupted several times (by calendar notifications, phone call from our enginner, ect). The final near fatal fail – was tripping over the projector cart power cable and watching the cart weeble and wobble nearly tipping the projector and my laptop over. Could it get any worse? I was almost afraid to ask! Luckily the wifi was back up before the teachmeet session, (VM server issue) and the technology fails disappeared. Thank you Matt and Matt! Artifacts from the day! I always appreciate photo’s and videos that capture the learning process. Next time, I would like to interview a few folks about this experience as it is happening. This post was originally published to MASA Leaders Forum Spring Newsletter (PDF). Since the original posting, I have also included artifacts of the learning experience. Enjoy! 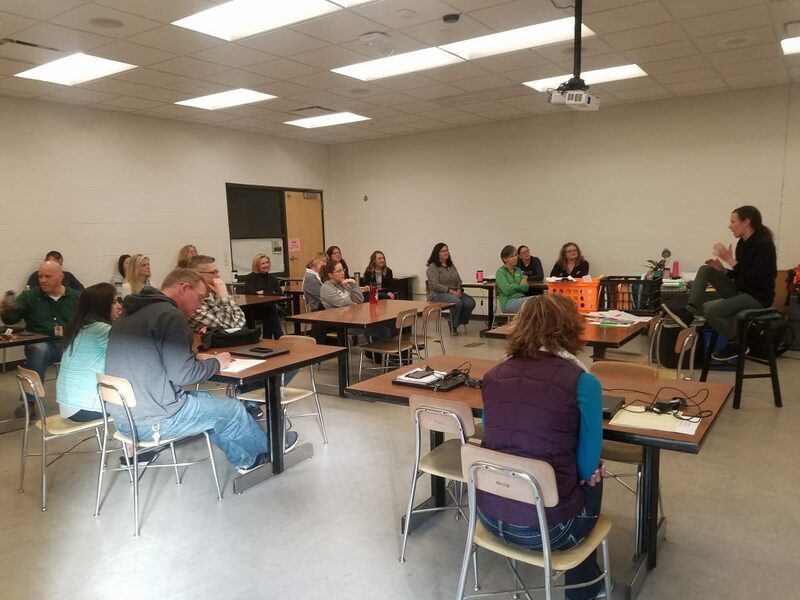 As you look at 1:1 student device implementation plans across MN, equitable access to technology is usually a driving goal. It’s important. If our kids do not have access to technology (with high-speed bandwidth) we cannot provide the visionary education of our future. However, getting devices into the hands of our students is only one piece of the puzzle. Michael Fullan is quoted as saying, “Pedagogy is the driver, technology is the accelerator”. If we are truly going to get the most bang, for all of our tech spending bucks, we must continue to focus on learning and how technology can support, accelerate and amplify it. We know that classrooms that solely rely on didactic teaching (one size fits all – I lecture you listen) does not work for all kids. Simply digitizing these classrooms will not improve results either. While putting content online may provide 24-7 access – if students are still only left to memorize or regurgitate the facts from videos/resources, learning will have very little chance of being deep and lasting. Student-centered instructional design is a great avenue for learning today with today’s tools. Below are examples of pedagogical best practices that support learner-centered instruction. I have had the opportunity to observe many powerful learning experiences, designed by educators, who continue to drive innovation to engage students and deepen learning. One such story comes to mind from this past fall. So what about technology? In what ways did technology accelerate or amplify student learning? If you were to remove technology from this project, would it have had the same success? If this project would have been more didactic aka lecture, listen, worksheet, test would it have had the same lasting results? I will let you come to your own conclusions. 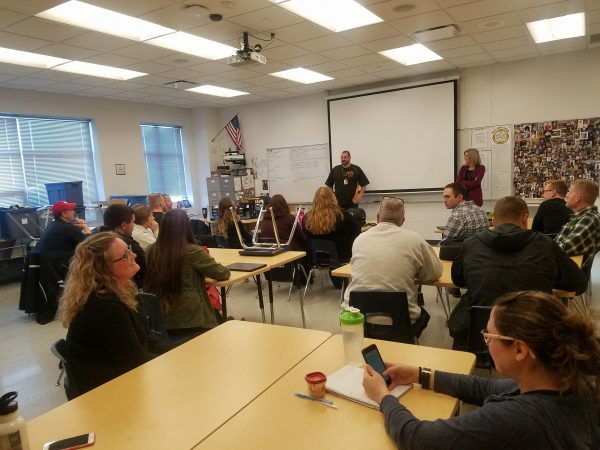 One final thought – It’s important to also reflect on the culture of the classroom, school, and district that allowed this powerful learning experience to happen. As with any innovation, there is a degree of risk and uncertainty. What if this fails? Well, what if it doesn’t? Even if it does fail, what does revision 2, 3, 4 look like for our students? Within a culture of learning and innovation, there must be a high degree of trust and transparency between administrators, teachers, and students. No matter what role we have in education, we must continue to support and foster a culture that allows powerful learning experiences for our students to happen. 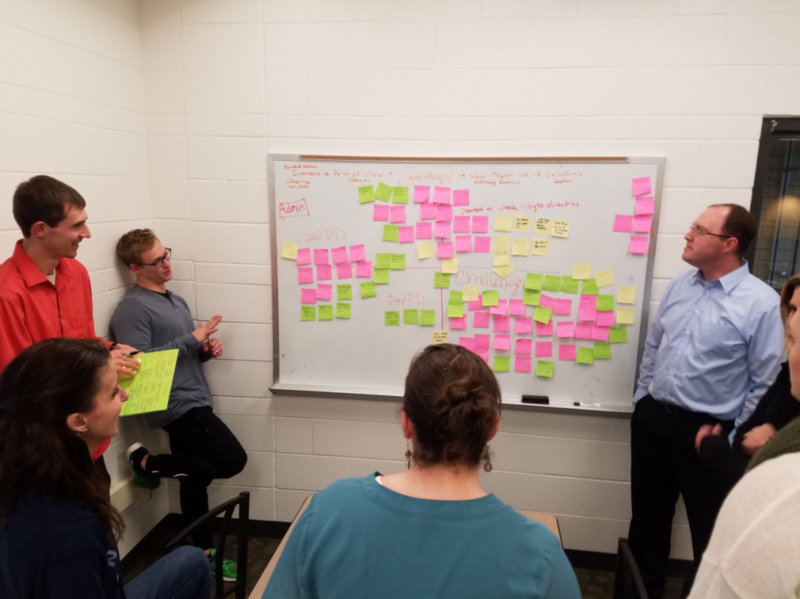 In my current grad class through Winona State University, Innovative Instructional Leadership, my students having been studying the diffusion of innovation, discussing/reflecting on leadership traits and applying design thinking strategies to create solutions to identified problems. 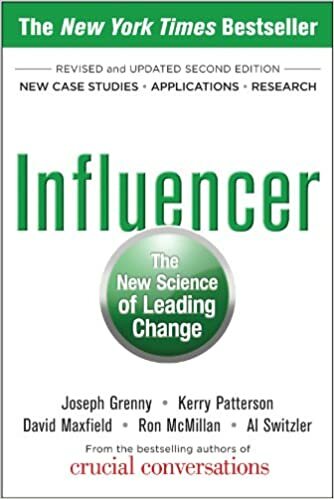 An activity we are working on right now – is a jigsaw of the book Influencer: The new science of leading change. 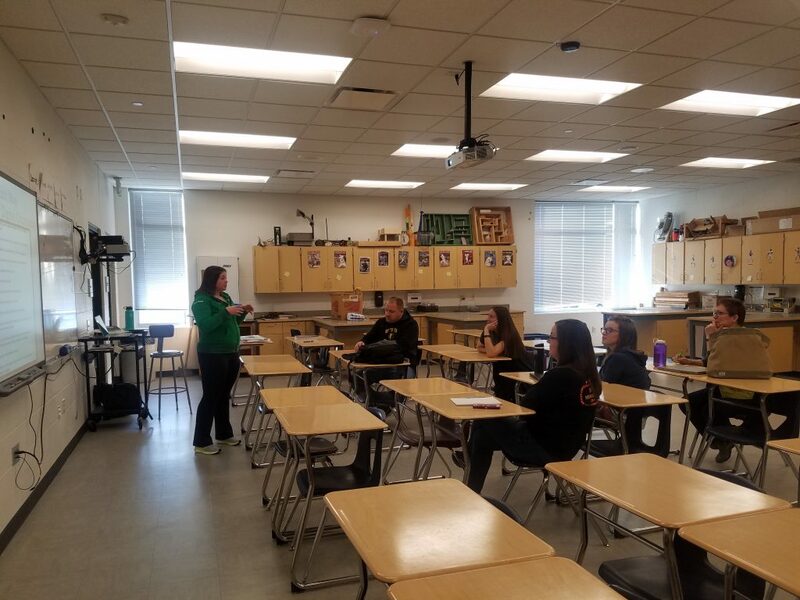 While I am writing this post -first for my students – I also felt it was worthy to post to my blog for my own reflection and opportunity for feedback from my PLN. This book provides leaders, established or emerging (this means you students! ), insight on how lead successful change. This is not change for the sake of change. Remember, our last face to face IDEATION session indicated nearly half a whiteboard of challenges from the perspective of students, teachers, and administrators. Engage all 6 sources of influence – Personal, Social, and Structural Motivation and abilities. Focus and measurement is crucial. You have to have measures of where you are – and goals of where you are going. Then measure again. What were the results? 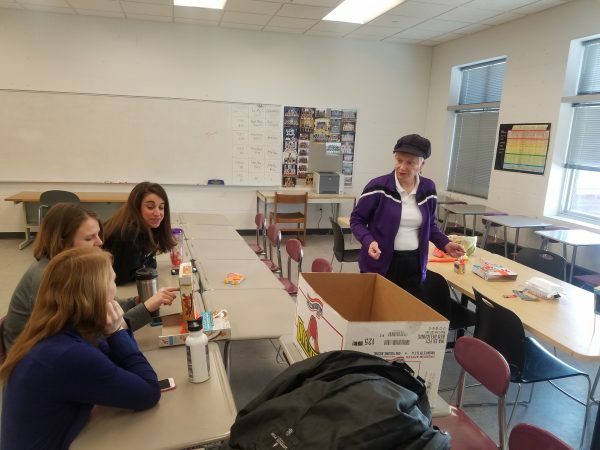 For many districts, the big measures tend to be test scores and as districts transition to personalized/project-based environments, I do believe, that we can give students great learning experiences (authentic/relevant) and still increase test scores. It has been so fun to see classrooms that are actively applying these new pedagogies. One mistake that I have seen (that I have also been guilty of) is focusing and getting so excited about the innovation – that the original learning goals get lost. We need to make sure we focus on our standards and continually assess our students meeting and exceeding those standards. This will help determine when we may need to provide extra support for our struggling learners. But…. I see the need for other measures beyond test scores. Of course, there are surveys and observations (as seen in a report http://bit.ly/531Snapshot) But I am not sure this is enough. I would really love to understand the district/school measures that go beyond test scores and are extremely effective. Vital Behaviors. What are the behaviors in an organization that drive results? What are the vital actions that drive change? What are the vital actions that are “culture busters”? Side thought: Once we have clear and compelling goals – how often do we find and share those stories of change and success? Stories can have an amazing impact on an organization/culture. On the other hand, how often are we willing to address those culture busters? Often, we let behaviors continue because of the fear of confrontation. The 6 sources of influence. 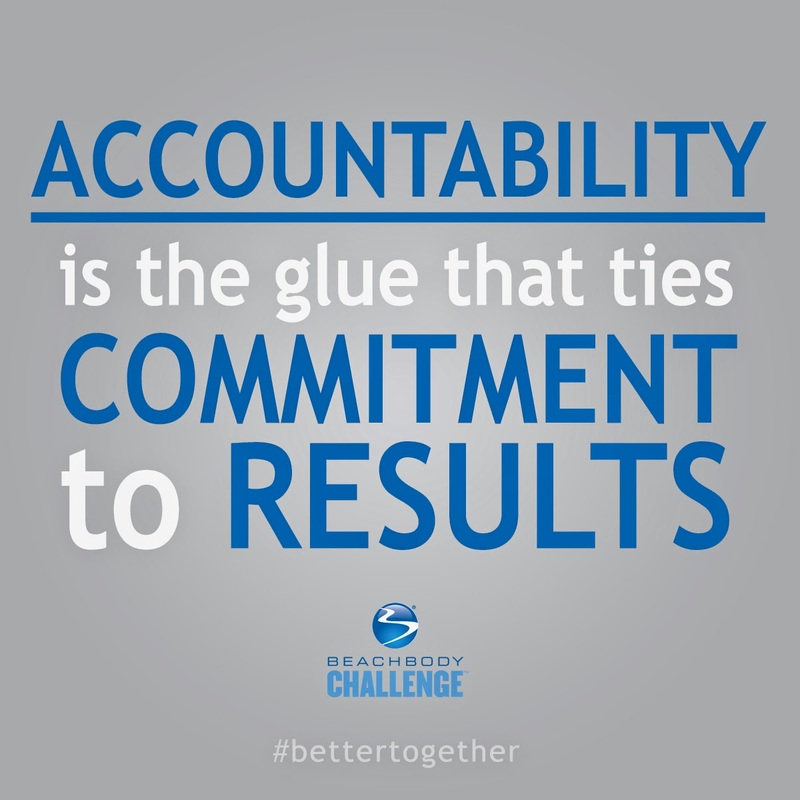 How do we motivate or enable a vital behavior to reach our desired goals? Motivation – one’s desire to make the change. Ability – one’s talent, skill, knowledge to do so. How often have our students not “reached their potential” due to motivation? Or how often have we seen students create great strides due to a huge increase of motivation? How do WE react to change when a change is imminent? Can I do it? Will I do it? Why should I do it? These domains are further divided into 3 subgroups – personal, social and structural. “These three sources of influence reflect and separate highly developed literatures: psychology, social psychology, and organization theory.” (p 69). It is these 3 sources of influences that are jigsawed and will be shared upon our next f2f day as teams of students will be delivering short but quality PD to their peers (not sit and get PD!). It’s important to think and reflect on these influences as both a leader within your classroom and a leader within your school or community. Not all will be equivocally useful -but will offer ideas to support revisions to solution prototypes! When reading this book it’s important consider our role as an influencers and our role to influence other influencers!